Classical and Jazz fuse in this ethereal vocal and instrumental music. 7 pieces of music featuring the beautiful counter tenor voice of Daniel Tucker and the elegant violin playing of Michael Peck, combined with the delicate piano, classical guitar, vocals and electronics of Ian Harris. An album that moves from breathtaking simplicity to dazzling virtuosity, creating varied landscapes of polished sound. “There are some classical music aficionados who are averse to the atonal tendencies of many modern compositions. Pianist Ian Harris however, has masterfully counteracted this trait with his clever inclusions of aurally pleasing tones and placid sparkle. On the Britain’s second album The Journey’s Threads he once again works with counter tenor Daniel Tucker and violinist Michael Peck. The opener “Over Ice Land” is hauntingly beautiful with its stark mysterious aura. Tucker’s vocals are lovely and ethereal with Peck and rustic flute calls echoing in the distance. Harris lends his vocals in the latter half of the song with his warmth nicely complementing the celestial counter tenor. The mostly instrumental “Between White Clouds” takes the romantic notion of painting the aural picture the title implies, yet Harris’ rendering is more sophisticated. The delicate bells and electronic noises he employs around his piano work are like the wispy silver linings of the clouds. Peck’s violin statements are thither and gone like a gentle gust. In the final portion of the song, Harris’ tender vocals sing the title. “Walking Towards the Rainbow” is a quiet piano solo that begins with a melodic idea twice stated, as if to build up the gumption. Then Harris gently and ever so subtly plays an eighth note journey of rises and falls like footsteps on a garden path, yet as glistening as the water from a stream flowing over smooth pebbles. The listener can become so absorbed that the ending seems to sneak up. Water is actually heard along with mechanical gears in the onset of “Of the Loss of Time,” whose lyrics are taken from the Elizabethan poet John Hoskins’ work of the same title. Harris mixes synthesized strings with Peck while Tucker chants in this more modern sounding piece with no clear tempo and long pauses. Each musical idea is independent yet with the echo and the counter tenor’s legato vowelizations there is a shroud of mist that encompasses and binds the song together. More direct is the violin and piano conversation in “Journey to the Horizon.” Harris and Peck at times sound like they are playing in different key signatures, yet the two instrumentalists deliberately and expertly continue their statements exhibiting excellent dynamics and musicality. “L’espoir d’été” loosely translates to “the hope of summer” and Harris plays a cheery lead on piano adorned with violin, bells, triangle and synthesized bass guitar sachets. His lovely grace notes on the keys and overlaid vocals at the end harbour tranquility. The most mesmerizing piece on The Journey’s Threads is the violin featured “Song of the Trees.” Peck is multi-tracked playing different voices crying their own lament, yet they all fit into each other by a greater design, like the giant canopy of an antediluvian forest. Harris plays classical guitar adding structure and a glint of sunshine as it pours down into the depths and touches the golden branches beneath the thick leaves. Faint electronic pings undulate quietly as the song hypnotically melds all the musical voices in and out of each other until finally fading away. The music found on The Journey’s Threads involves the three-fold combination of counter tenor Daniel Tucker’s vocals, Michael Peck’s violin and Ian Harris’ piano and various electronic instrumentation. It’s a 7-song release that veers among jazz, classical pop and what used to be termed new age music. This album, however, is under Harris’ name. Harris is both a composer and a video artist based in the UK. He’s a trained visual artist, with a BA in Fine Art, as well as a scholarly musician with an MA in music. One of his more fascinating past works is the music he created for a 2001 film version of a Thomas Mann novel, which was broadcast on BBC Radio 3. He’s also worked on orchestrations for multi-instrument performances, some of which were presented at the famous spiritual event, Greenbelt Festival. The album’s most classical sounding track is one titled “Walking Towards The Rainbow.” It’s a mid tempo piano piece that clocks in at 3:29. For whatever reason, it conjures up images of an Irishman searching for that pot of gold at the end of the rainbow. Maybe it’s the word ‘rainbow’ in the title that brings such stereotypical pictures to the mind. Nevertheless, it’s a pretty tune and quite a meditative one. “Of The Loss Of Time” makes excellent use of Tucker’s vocals, as his voice simply soars over the instrumental section of the piece. This track is music put to a poem by John Hoskins, who was not only a writer of poems, but also a scholar of Greek, a lawyer, judge and politician. It’s interesting to hear the way Tucker’s voice plays off Peck’s violin on this one. It’s a credit to Tucker’s singing ability that many times the listener may have trouble aurally discerning the difference between the vocal parts and the string parts. Tucker is such a spot-on singer when it comes to hitting the right notes; there are portions when his vocal and Peck’s violin blend together nearly seamlessly. This is fascinating, and likely one of the probable reasons Harris chose to include both of these two artists on his project. “Journey To The Horizon,” on the other hand, is an excellent collaboration between Harris and Peck. This one leans particularly close to the jazz spectrum of the stylistic continuum, as both Harris and Peck trade notes throughout. It leaves the overall impression of a jazz standard, only performed instrumentally. “L’espoir d’ete,” is a slow, thoughtful piece. The project's finale, “Song of the Trees,” multi-tracks the violin for both a beautiful and mysterious creation. One imagines environmentalism is near and dear to Harris’ heart, as the cover photo on his album is a close-up of a very green leaf. The inside cover pictures a similar leaf, only this time a red one. The overall impression left by this work is that of beauty. Beauty that is consistently found in nature, matched with beautiful music likely intended to reflect nature’s beauty. Rock and pop music fans may be hesitant to investigate an album such as this one that prominently features a counter tenor singer in its credits. For many, the very thought of a classical participant might give them cause to hesitate. However, once you hear what these three talented musicians have created together, your prejudices will likely disappear like a vapor. Those who haven’t listened to a lot of new age releases might think of new age as a genre that is electronic 100% of the time. But while it is true that some new age recordings rely on electronic programming exclusively, that is by no means true of all new age recordings. Many other new age albums have successfully combined the electronic and the acoustic. On such albums, electronic programming and synthesizers are likely to be used alongside acoustic piano, acoustic guitar and acoustic violin or, in some cases, traditional world music instruments such as the Indian sitar, the Turkish saz, the Arabic oud or the African kalimba. And on The Journey’s Threads, U.K.-based pianist, guitarist, composer, producer and vocalist Ian Harris not only blends the electronic and the acoustic: he gives acoustic instruments the upper hand. Some electronic programming is used on these tranquil, peaceful performances, but truth be told, it is electronic programming in service of acoustic piano, classical guitar or acoustic violin. Acoustic instruments dominate this 2014 release (which is devoted to Harris’ compositions exclusively), and Harris’ use of electronics is an attractive side dish rather than the main course. There are three participants on The Journey’s Threads: Harris (acoustic piano, classical guitar, vocals, and electronics), Michael Peck (acoustic violin) and Daniel Tucker, who provides some additional vocals on “Over Ice Land” (as opposed to “Over Iceland”) and “Of the Loss of Time.” And all three of them do their part to give The Journey’s Threads a warm, organic type of sound. This is the sort of new age album that sounds a lot more played than programmed, and Harris’ material never sounds stiff or mechanical. Harris’ ethereal work incorporates a variety of direct or indirect influences, ranging from jazz to the mellower side of progressive rock (as in the Moody Blues) to European classical music.The violin has a long history in the European classical tradition, and Peck is clearly mindful of classical violin when Harris features him on “Journey to the Horizon” and “Song of the Trees.” Meanwhile, Harris’ acoustic pianism hints at both Euro-classical piano and post-bop jazz piano on “L’Espoir d’Été,” “Over Ice Land” and “Walking Towards the Rainbow.” Harris sounds like the type of acoustic pianist who could have some Keith Jarrett in his CD collection along with performances of Beethoven and Chopin’s works. 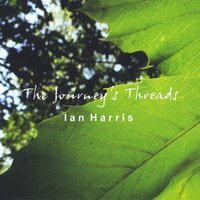 Harris’ publicity bio mentions that he composes music for independent short films and that his own films “have been screened at various festivals, galleries and events in the UK and Europe.” Listening to The Journey’s Threads, one can easily picture Harris’ compositions being used in an independent film setting. However, the seven selections on this CD work well on their own without any type of visual stimulation. One can sit down, close his/her eyes and easily appreciate the musical craftsmanship and thoughtfulness that went into The Journey’s Threads. Some new age recordings can come across as shallow, but it is clear that Harris is going for depth and put a great deal of thought into this project. The Journey’s Threads is worth checking out if one appreciates the more organic, less programmed side of the new age genre.